While looking through Dr. Lovett’s files, I ran across something that made me laugh. I immediately scanned this letter from a hotel keeper in Sherman thinking it would make a funny little post about well-behaved Rice boys. Then, for no real reason, I started to wonder about the game. The April 29, 1921 edition of the Thresher tells us that Rice lost, falling 0-3 to the Kangaroos of Austin College. The game was slowed by weather delays and the second half of the scheduled double-header was cancelled because of rain. I checked the Woodson’s photo files to see if I could find a picture of these well-mannered lads, but there was only a picture of Eddie Dyer, who had been the losing pitcher in that game at Sherman. Curious about why he would have been singled out, I began leafing through the Thresher and quickly discovered that Dyer was something special. 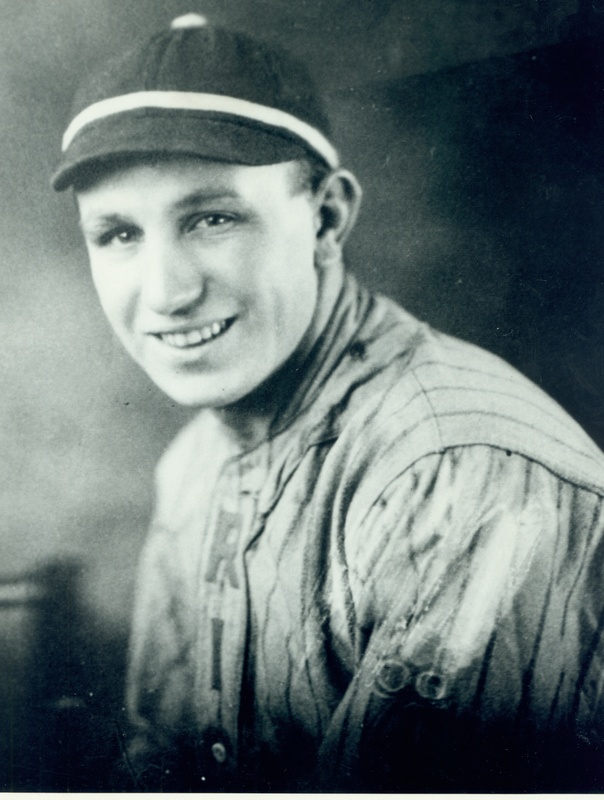 The week before he had thrown a no-hitter against Baylor and he was named to the SWC All-Conference team three years in a row, from 1919 to 1921. Dyer’s career after he left Rice was really remarkable. He signed with the Cardinals in 1922 and pitched until he hurt his arm in 1927. He continued to play as an outfielder until 1933, but it was as a manger and baseball executive that he made his most important mark. Dyer was instrumental in helping Branch Rickey build baseball’s first real farm system and then managed the Cardinals to their 1946 World Series win over the Red Sox. 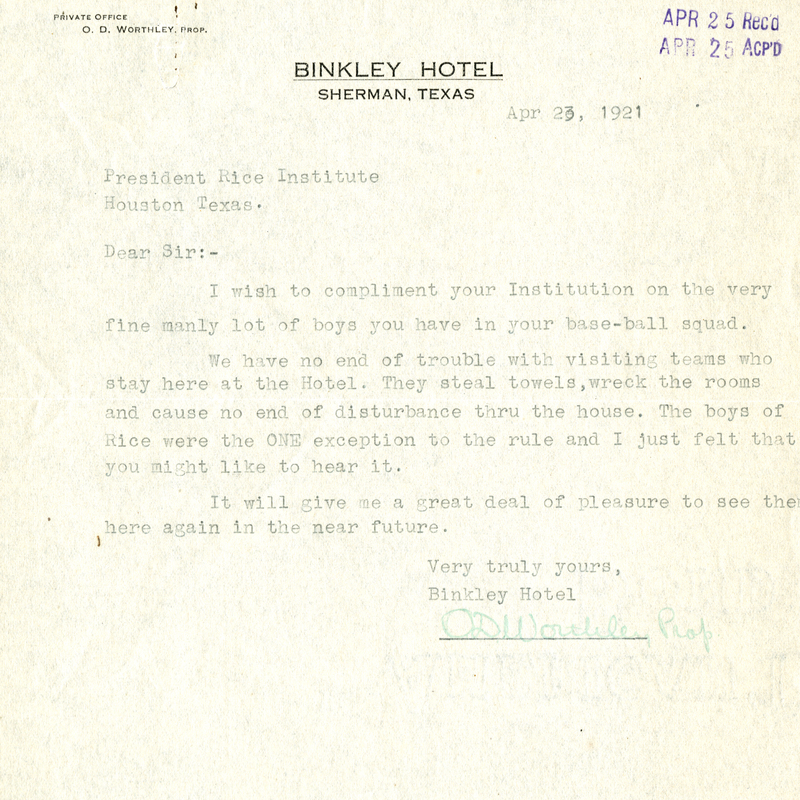 He completed his Rice degree in 1936 and coached freshman football here (during baseball’s off-season) for several years. After retiring from baseball he had a very successful career as a businessman. He died in Houston in 1964 at the age of 64. (For a lot more on Dyer, see here.) By all accounts he was a fine man, intelligent, friendly and easy going, just the sort who would have drawn the praise of a small-town Texas innkeeper who had had his fill of obnoxious ballplayers. The 1921 Campanile might have a photo of the baseball team. Fondren has a collection of all the Campaniles going back to 1916.